Delhi Belly has got a great buzz around it like any Aamir Khan film due to a praiseworthy promotional strategy which has worked really well for the film. Delhi Belly has been promoted in a very unconventional manner with the help of a number of music videos which will not be part of the film. Promotions started with the song Bhaag D.K. Bose which became an instant hit and has brought a lot of curiosity for the film. Delhi Belly being an adult comedy, a strong emphasis has been put to warn the viewers to exercise discretion so as they should have right expectations from the film. Though the film is only meant for open-minded adult audience, it is expected to open really well at the Box Office due to great curiosity amongst the target audience. Delhi Belly which was has always been marketed as an adult comedy has worked with the majority of the intended audience in a big way. The film got a great response from the audience as the opening has been brillliant. 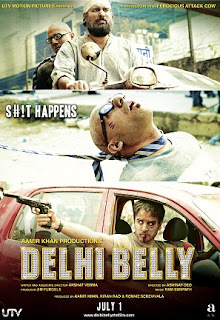 Most people feel that Delhi Belly is the most fun they have had in a while and would not mind seeing it again. However some of the audience felt that it had overt use of the cuss words, something which was always expected of it. Overall it seems that the film will have a good repeat audience and should carry on doing well in upcoming days. It teems with youthful verve but it’s also derivative and inconsistent, with patchy storytelling.....it’s pacy, fitfully funny and, in its determination to upend cultural expectations, likeably mischievous. ..a smartly paced, highly entertaining Bollywood gagfest. Uninhibited and naughty, Delhi Belly is an enjoyable comedy that has enough frenzied moments to keep you in your seats. On the whole, DELHI BELLY is a ground-breaking and inventive comic caper targeted at the youth brigade. Delhi Belly is an enjoyable, unconventional Bollywood film! Delhi Belly is lethally funny and cynical. It is so gaudy and profane that you can't say it isn't fun in its own exuberant way. Do watch. it's a reasonably quick ride, and at ninety-odd minutes, never really flags too much. DELHI BELLY is a fun ride which gives toilet humour a whole new meaning. Watch it for its craziness!